A good friend recently returned from NY and, as a souvenir, gave me a bar of chocolate. 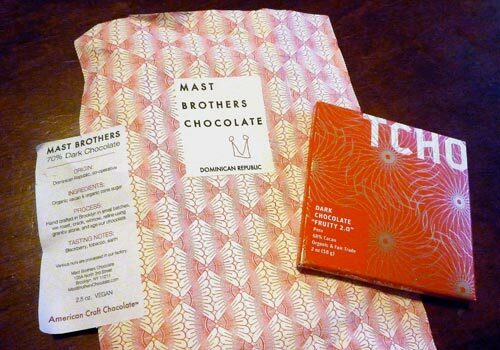 It hailed from Brooklyn and read “Mast Brothers Chocolate” with this particular bar sourced from the Dominican Republic. It was gorgeously wrapped in a heavy, uncoated paper printed with a pattern reminiscent of vintage book endpapers. The chocolate itself was delicious—like fine wine, in fact, with a sophisticated depth of flavors. It wasn’t cloyingly sweet (like most available chocolates that I think do this to hide their flavor flatness/blandness). I savored every bite. Just today, I discovered a video (via Honest Fare) on the two brothers who are the craftsmen behind this chocolate. They talk about their process and the video really gives a good sense of the care and dedication with which they approach their chocolate-making and -selling craft (each bar is hand wrapped!). It’s inspiring to witness their quiet passion and the level of detail on which they focus. Amazingly, all of these qualities are conveyed through their packaging. This entry was posted in Craftmanship, Packaging. Bookmark the permalink.